At Hope&Glory we like to think we’re a fashionable bunch (debatable), and regularly keep an eye on the latest catwalk trends. So when we noticed Balenciaga had moved on from IKEA bags and had debuted a skirt in its new A/W range that looked suspiciously like a car mat, we couldn’t help seeing it you could get the look for less at Argos, the nation’s favourite retailer. Fashionistas across Britain will be delighted to hear in fact, you can. 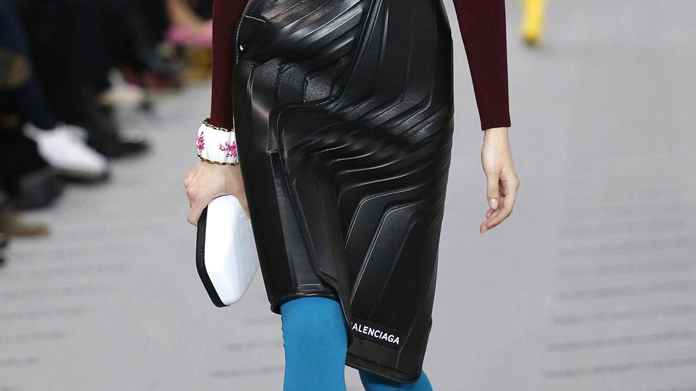 Whilst Balenciaga’s skirt will set you back by £1,795, its embossed leather design draws close parallels with Argos’s Cosmos Duro All Weather Car Mat which can be snapped up for as little as £14.99. What’s more, the mat comes in a four-piece set, offering run-way style at a fraction of the price, as well as an all-weather and non-slip design that can withstand the worse of British weather. So when the lovely people at Balenciaga came up with the skirt above, we were quick to spot it and bang out a quick, cheeky response from the good people at Argos, thanking them for clearly having been inspired by one of the retailer’s car mats. It was turned around within a couple of hours of spotting the story, complete with a side-by-side comparison of the Balenciaga skirt and the Cosmos Duro All Weather Car Mat. The result was as swift as it was impressive. First of all, Dazed & Confused picked up our response with a tongue-in-cheek piece about the homage. Next, the good people at Harper’s Bazaar wrote the story up. And then Harper’s in Australia joined the fun. Things only got better as ELLE UK picked up the tale (followed by ELLE Singapore). Following those, we also found ourselves gracing the pages of Azzurro Due, Diario16, Vogue Portugal, Sindo News, and Cosmopolitan to boot. Simple media story, neatly executed.